have a negative connotation for many. fear what a background check will find. “This fear (of background checks) often arises out of a lack of understanding about what a background check really entails. Applicants are confused about what will be checked, worried about their privacy being compromised, and don’t know what an employer is really looking for!”, excerpt from “Are You Afraid of Background Checks? They’re Not as Scary as You Think!”. It is this misunderstanding and miscommunication that causes a lot of the anxiety about background checks. You may think that employers actually want to find out negative things about you. When, in reality, nothing could be further from the truth. When it comes time for the background check, employers are really just verifying that they have made the right decision when it comes to hiring you! 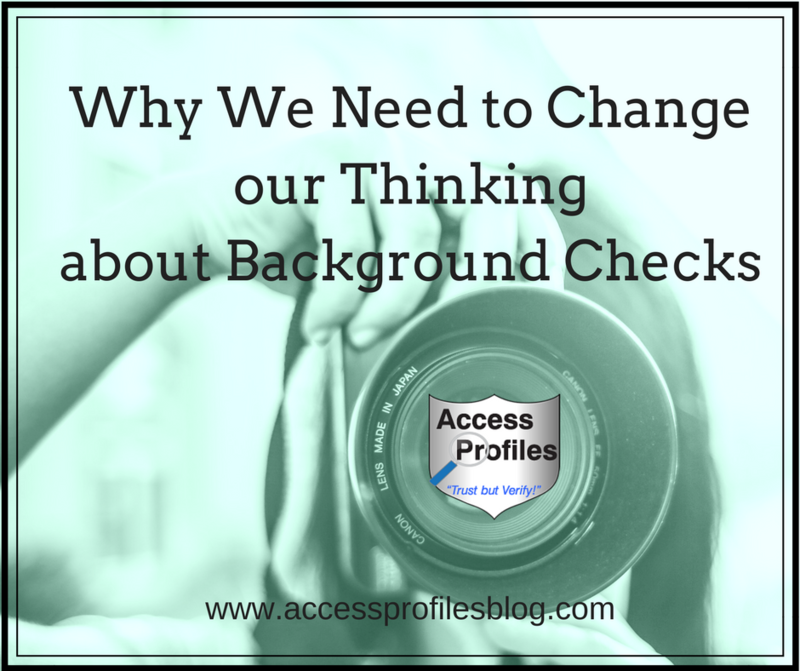 “By running a background check, Employers are simply looking for confirmation that they have made the right choice. By this point in the hiring process, they have already read your resume, interviewed you, and, out of all the other candidates, picked you as a good hire. They have invested a great amount of time and money. And they will have to spend even more screening you. But while popular belief is that the intent of a background check is to find a way to keep you from getting the job, this is simply not true.”. Find out more about what an employer is looking for during the background check here! We need to recognize that a background check is not about highlighting any of the things you have done wrong. Instead, it is about finding the things you have done right! It is about truly reflecting your life’s journey. highlight your best assets makes sense. You should begin with your resume. First make sure it accurately features your education and training. You should include high school, college, or any other kind of learning opportunities you may have pursued. A good background check will then verify it. It is also important to share your skill set. List projects you have worked on, changes you implemented, and be sure to mention the positive outcome of your efforts. A background check will then confirm this by contacting your former employers. Investigators will ask specific questions designed to discover the qualities you brought to the workplace. Things like leadership and initiative are definitely valued. Your resume should even include the interesting things about you! Your volunteering efforts or causes you are active in makes you more interesting to a potential employer. This attention needs to continue on to your social profiles. Employers are increasingly using social media as part of the screening process, so make sure what they find will show you in a good light. The goal in checking social media “will be to find any relevant posts about you and use them as a cross-check against (your) resume”. This will include considering “both positive and negative posts. Positive posts can include mentions of awards received or charity and volunteer work you or your applicant are involved in”. Negative posts may include excessive complaints about a current or past employer and certain “behaviors depicted online that might be undesirable to a potential employer ~ explicit photos, illegal activity, etc.”. 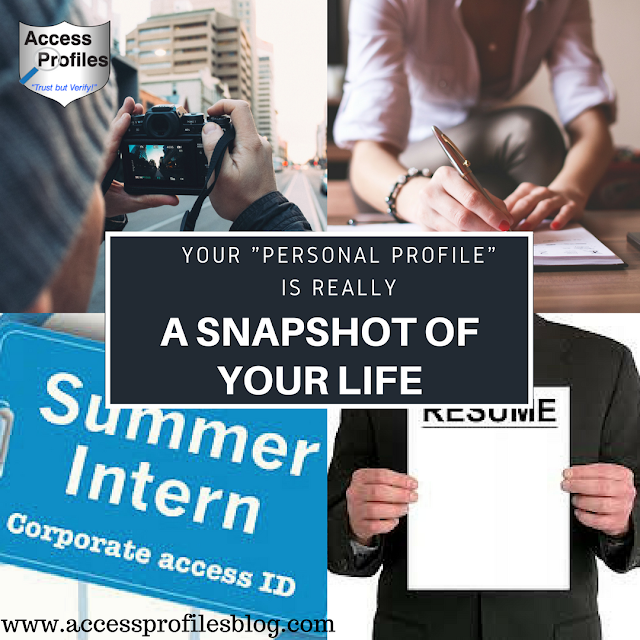 You can find out more about making your resume and social media profiles help you to get the job in “Tips to Help You get Your Resume Background Check Ready" and “Why I have Added Social Media and Resume Screening to My Services”! about your upcoming background check. is a step in the right direction! a true “profile” of your life. That is one of the reasons I picked Access Profiles as my company name. I believe in helping an employer or job seeker by providing the most accurate “profile” of their candidate possible. That is what it is all about. It is my true focus and passion. A person is more than just their past. and a good background check reflects that. A true Personal Profile will be a snapshot of where you have been, what you have learned, and who you are now. But it is your job to make that picture as positive as possible! focused on You and Your Small Business, Subscribe Now! You will receive one new article each week with the Tips and News You Need! Thanks!